The history of Wartburg cars goes back a long way, right back as far as 1898 when the first cars were produced in Eisenach in Germany. Before WWII a diverse range of vehicles were produced at Eisenach including the Dixi, a version of the Austin 7 built under licence. Prior to the War, the Eisenach factories were part of BMW building high quality cars and motorcycles. After the war, Eisenach fell within Communist ruled East Germany. The car and motorcycle factories in Eisenach were incorporated into Industrieverband Fahrzeugbau, or IFA. The group incorporated all the major vehicle manufacturers in East Germany. 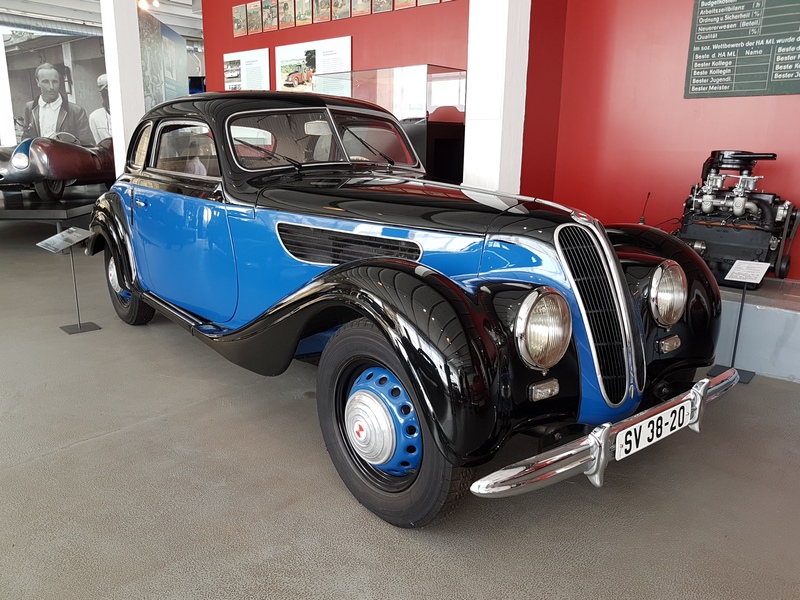 Production of cars and motorcycles restarted in the Eisenach factories with modified versions of pre-war BMW cars and motorcycles. Initially these were sold under the BMW badge but this was quickly changed to avoid problems with BMW in West Germany. Cars were subsequently badged as Autowelo and later as EMW (Eisenach Motoren Werke) as they were further developed while motorcycle production faded away. There was a great need in the Eastern Bloc countries for cars that were simple to build, maintain, and own. There was also a need to export cars and earn vital foreign currency. As a first step to achieving this, production of the IFA F9 car was moved to Eisenach. Before the war DKW had been developing a new 3 cylinder 2-stroke car. Development continued after the war along divergent paths in both East and West Germany. 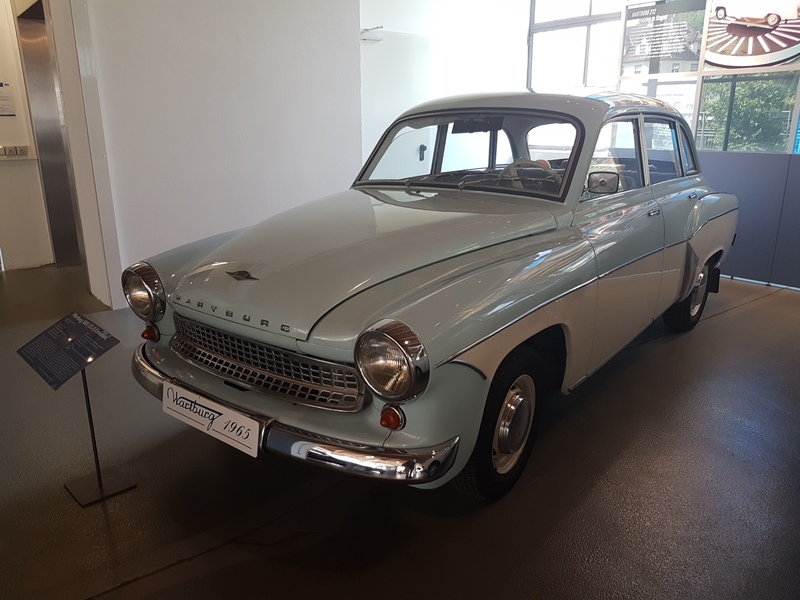 The East German version, the IFA F9, was initially produced in Zwickau by the Sachsenring factory which was later to go on to produce the Trabant. The F9 was exported to many countries including Europe and South America (where it was also manufactured under licence), but did not come to the UK other than one or two imported for evaluation purposes. The 1950s saw much work on the development of a new range of cars. The chassis and engine of the F9 was used as a starting point. The new cars featured a more powerful 900cc 3 cylinder 2-stroke engine and a separate ‘perimeter’ type chassis with independent suspension by transverse leaf springs. In 1956, production of the new range of cars started with a wide variety of models based on a common engine/chassis configuration. This included a saloon, two estates, a coupe and convertible, plus a 2-seat sports car and sports convertible. These cars initially bore ‘Eisenacher’ badges and were known as Eisenacher Typ Wartburg or EMW Wartburg. They were exported to many countries including Europe, South America, USA, South Africa and China. It wasn’t long before the cars simply became known as Wartburgs with the model number 311 for all cars except the sports which had the model number 313 (the F9 was model number 309). The cars were built to a very high standard, as one would expect from workers previously used to producing BMWs. Heavy gauge steel was used giving strong sturdy construction – much use was made of polished aluminium castings and pressings. Some of the cars featured wood and/or leather trim too. During production, the range was expanded to include van and pick-up versions. A 4-door convertible was produced in small numbers for military and police use. In the late 1950s a few Wartburgs were imported into Ireland but were still unknown in the UK. They were probably imported in kit form and assembled in Ireland, as was the case with DKW and other imported marques, as locally assembled cars attracted much less tax. In 1962 the range of cars received its first major revision. 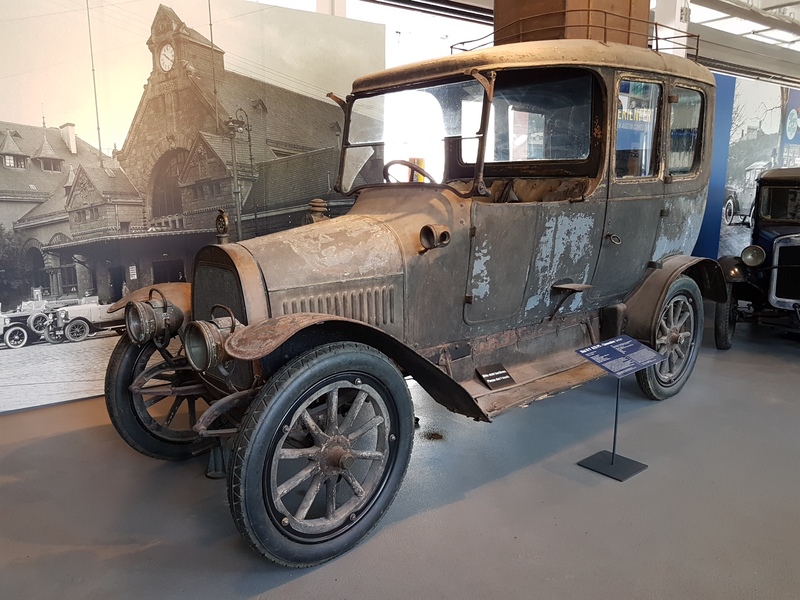 The basic body style was retained but the car had many improvements including increasing the engine size to 992cc with major improvements to the cooling system, transmission and drive train. Many other changes resulted in the new cars sharing surprisingly few parts with the visually similar previous model. At this time the cars continued with transverse leaf spring suspension. 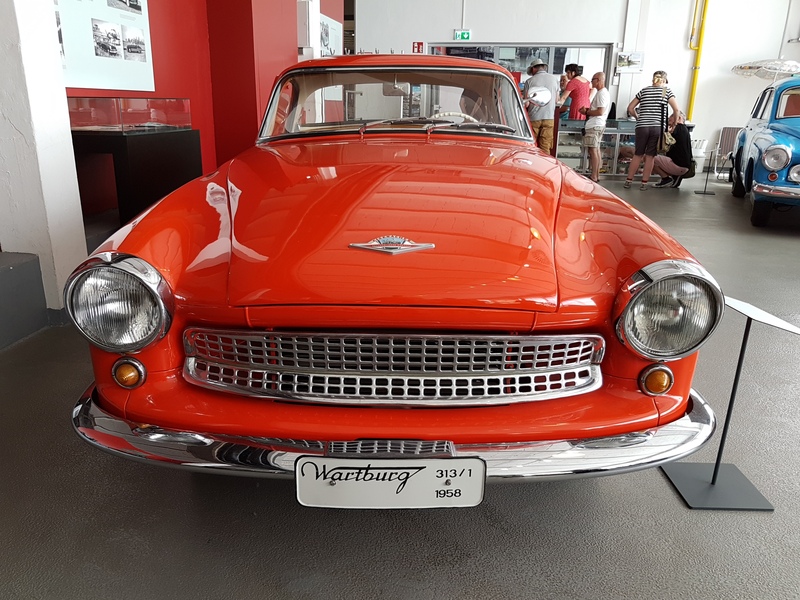 The new cars, given the model number 312, were sold in various countries such as Poland and Czechoslovakia as the Wartburg 312, but strangely it continued to be known as the Wartburg 311 in East Germany. This leads to much confusion and heated debate over Wartburg model numbers! Right hand drive cars were made from the start of production with initial exports probably going to India and Africa, and reaching Cyprus in 1963. 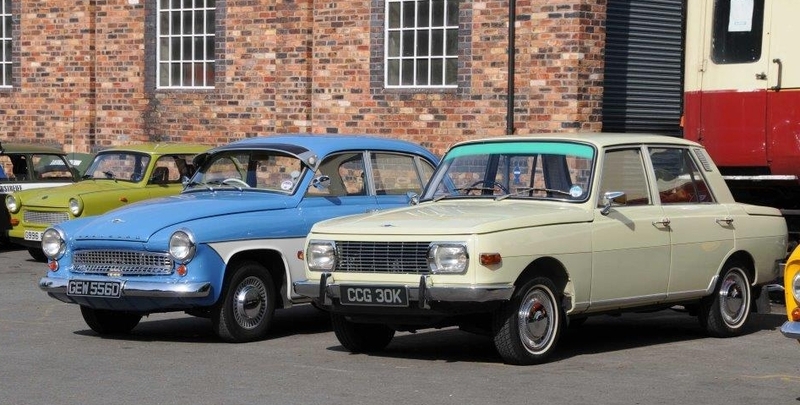 In 1963 Wartburg cars were displayed for the first time at the London Motor Show (along with Trabants!). An agreement was reached with Industria Ltd to import the cars into the UK. Industria were already importing Jawa and CZ motorcycles from Czechoslovakia and had been in talks with East Germany for some time initially looking at importing the F9. 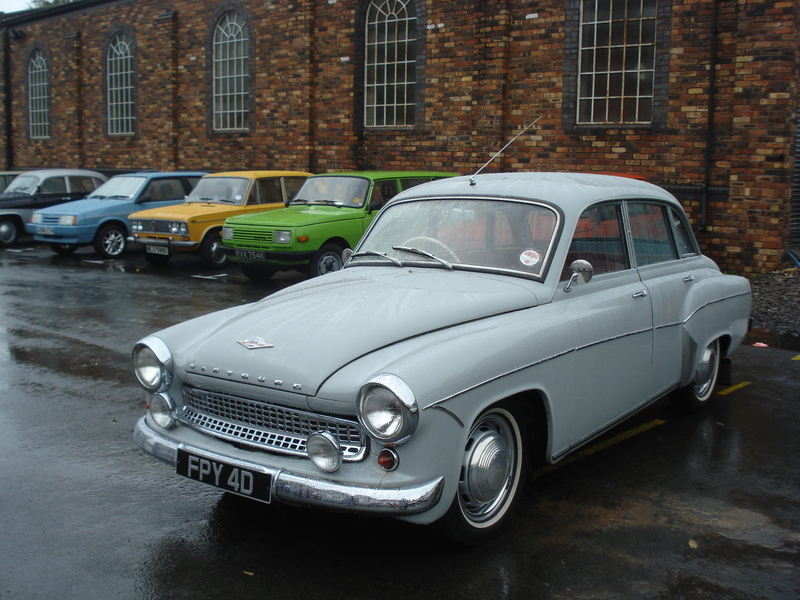 Industria set up a network of dealers in the UK and the first cars were sold in 1964. Initially, only 4-door saloon cars were sold in the UK. About 300 of these RHD cars were imported, together with an odd one or two 3-door estate cars. In 1965 the range of cars received its second major revision. Again, the basic body style was retained but underneath the car was all new featuring a new chassis with coil spring suspension, a much revised more powerful engine and many more improvements. A big selling point of this model was its 30,000 mile service interval – this was at a time when many cars needed servicing every 3,000 miles! To add to the confusion over model numbers this car was given the model number 312/1 and is usually referred to as just 312. Between 1965 and 1967 about 450 RHD Saloons and just under 100 RHD Estates were imported into the UK. In 1967 a completely new car started production. This featured a much more modern body but underneath was a perimeter chassis and 3 cylinder 2-stroke engine based on the final incarnation of the previous model 312/1 cars. Two main models were produced: a 4-door saloon and a 5-door estate. A pick-up truck version was later produced together with a small number of open top ‘Jeep’ like cars for the military. This new range was given the model number 353 – the estate was called the ‘Tourist’. For the UK market the saloon was called the ‘Knight’, and the estate the ‘Knight Tourist’. The exact number of vehicles imported into UK between 1967 and 1976 isn’t known but is likely to have averaged between 500 and 1000 per year. During this time the 353 underwent three major revisions culminating with the Mark 4 introduced in 1971. Industria had already branched out into importing Mazda cars from Japan. When changes in vehicle regulations made it increasingly difficult to import Wartburgs into the UK, they simply stopped importing Wartburgs and concentrated on Mazda cars. The current Mazda importers can trace their history back to Industria. After 1976, development of the cars continued in East Germany with further improvements made from time to time. Right hand drive cars were still made but were no longer available in the UK. 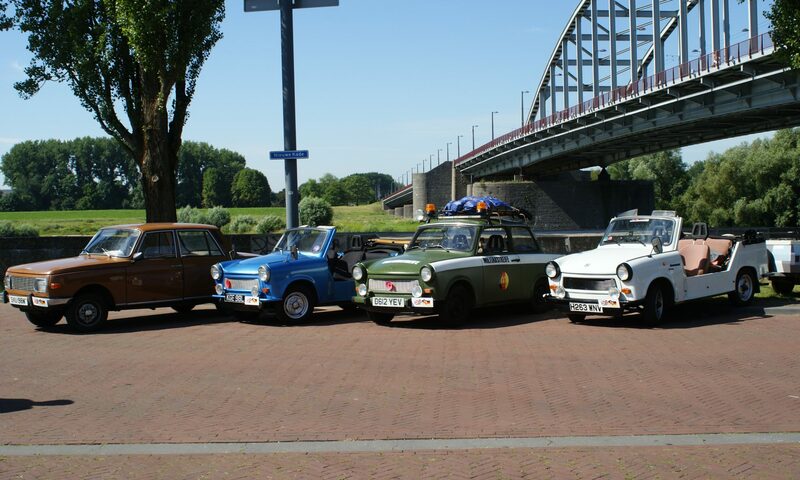 A few Wartburg cars were personally imported by private owners, usually LHD cars bought new from a dealer in Belgium. In the early 1980s a cancelled export order of LHD Wartburgs for Egypt ended up sitting in the docks at a UK port. Approximately 100 of those cars, built several years earlier. were acquired by an old, established UK Wartburg dealer. Most were converted to RHD using parts from older, rusty UK specification cars and sold as the Wartburg Lancastrian. In the 1980s negotiations with VW resulted in IFA securing a licence to produce engines based on the Polo and Golf units. In 1988 an adapted version of the 1300cc Golf engine was fitted to a new model, the Wartburg 1.3. This was visually similar to the previous model 353 but, apart from the engine, had many differences. The 1.3 remained in production until 1991 when, following the collapse of sales after German unification, the factory closed its doors for good. General Motors Opel division built a new factory in Eisenach to employ some of the redundant Wartburg factory workers. A few Wartburg 1,3s were imported into the UK including one estate which was converted to right hand drive but is now believed to have been scrapped. 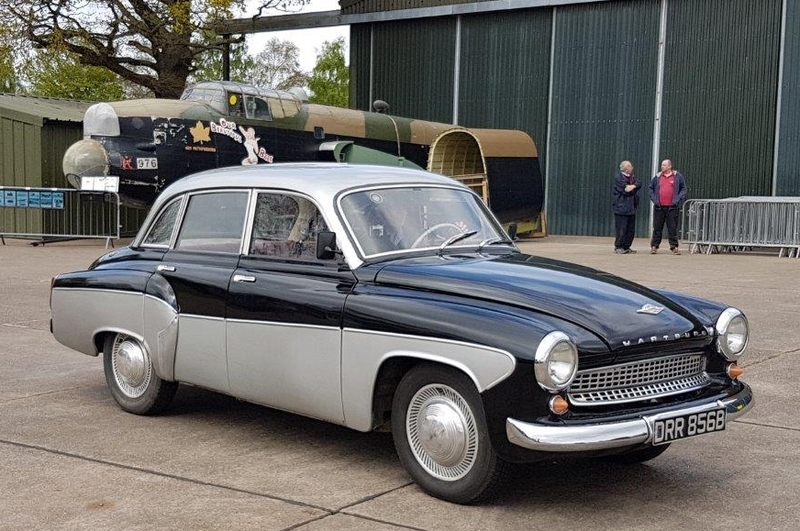 More recently, a steady flow of Wartburgs have been imported to UK from Germany and former Eastern Bloc countries as interest in these vehicles and the Cold War period generally has increased.